Living costs in Spain are more than £22k cheaper than the UK. Spanish utility bills alone are up to £400 lower. A one-bed city apartment is more than £200 cheaper per month than the UK average. With more sun, less rain and more sunshine, the benefits extend further than just cost savings. Despite the effects of Brexit, emigrating to Spain can still save Britons an astonishing £22,168 in living costs, according to new research. Collated by thinkSPAIN, the data shows how the cheaper cost of accommodation, entertainment, childcare, food and drink, healthcare and transport makes moving to a place in the sun a dream well worth fulfilling. Property prices can make or break the deal for those on the fence about starting a new life abroad, but Spanish property is five times less per square metre than the UK average. The land of sangria’s average of £3,854 per square metre makes Blighty’s £17,766 look all the more painful. Local public transport costs are also significantly lower. While the average price of a one-way ticket here is £2.40, Spaniards only have to shell out £1.23. Petrol, as a symbol of something becoming increasingly expensive throughout the world, is still cheaper in Spain. The saving of 12p per litre over the UK may sound small but, over a year, it typically means spending around £144 less on fuel. Cinema trips may be viewed as a luxury and with the average UK price tag of a hefty £10 per ticket, it’s easy to see why. However, over in España, a ticket is almost a third cheaper, with a price tag of £7.05. The Spanish climate may not come with a price tag, but can offer a better quality of life than the UK. You can ditch the winter coat for shorts and sandals, with an average high temperature of 19.6 degrees celsius in Spain, compared to a mere 14 degrees celsius in the UK. 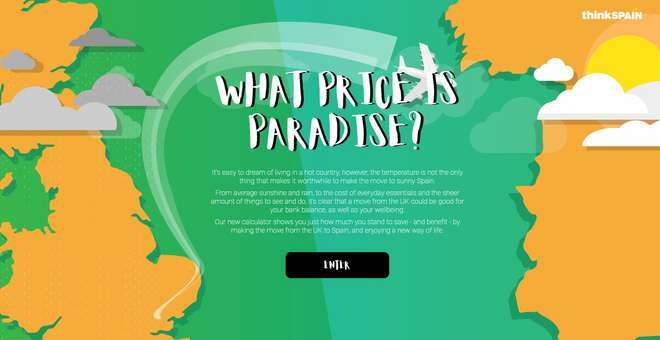 To help make the decision easier, Spanish property company thinkSPAIN created What Price is Paradise?, a comprehensive guide that compares the costs of living in the UK versus Spain, and highlights some hefty savings to be had by moving. The guide also includes non-monetary benefits, such as hours of sunshine, congestion level and quality of life, adding further weight to the argument that Spain really is the place to be.